The TWA Flight Center, designed by Eero Saarinen & Associates and built in 1956-62, is among the chief works of one of the most highly-regarded architectural firms of the modern era. 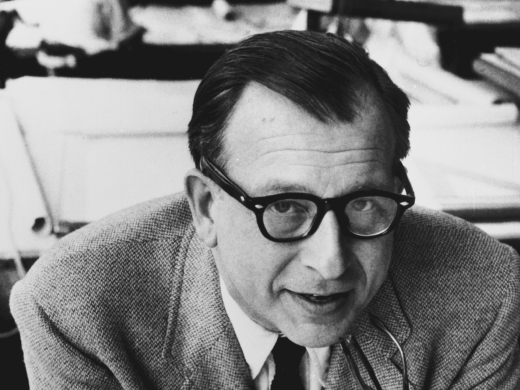 Saarinen's firm revolutionized air terminal design through its use of daring concrete and glass forms and technological advances, producing a distinctive and highly-acclaimed work of expressionist architecture. The main portion of the terminal - created by four intersecting vaults separated by narrow bands of skylights and supported on four Y-shaped piers - has an upward soaring quality. The design of the building expressed Saarinen's intention "to interpret the sensation of flying" and "be experienced as a place of movement and transition." The Commercial Design Award of Excellence is given for the restoration of the TWA Flight Center at the John F. Kennedy International Airport. At its opening in 1962, the TWA Terminal “was celebrated as a major achievement in modern architecture and quickly became a symbol for the “golden age” of commercial aviation.” After being listed as a New York City Landmark in 1995 and the National Register of Historic Places in 2005, the sensitive work done by the New York City firm Beyer Blinder Belle restored significant details and defining features such as the failing curtain wall, the “penny-tile” finish, and removed inappropriate exterior additions. Most importantly, tours and events held at the restored terminal have inspired a resurgence in interest of Saarinen’s building by the general public. in the expansion of the airport. steel beam of the new construction was put into place in October 2006. Oct. 17, 2006, 31 January 2007 < http://www.primezone.com/newsroom/news.html?d=106993>.